Designed by RHOX to fit Club Car DS. Vacuum-formed seat cushions match OEM colors and welt pattern. Steal frame with black rugged powder coat. Easily flips from rear facing seat to fold down bed. 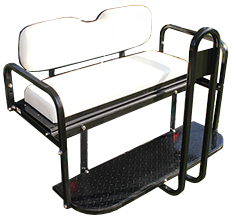 Steal footplate with step plate support bracket (included) provides reinforced footing and added durability. Years 2001.5-Current OEM struts can be reused with OEM top. You reuse your factory rear top struts.